The Small Pod is 7ft 7in by 8ft 10in and sleeps two adults and one child or two small (under 10) children. The pod is an empty, carpeted space but has a lamp, a heater and a socket. There is a picnic bench outside each pod, and the price includes use of our kitchen facility in the amenity building. You will need to bring all your camping kit - apart from the tent. There is a two night minimum stay during the school holidays and summer weekends. The Family Pod is 8ft 8in by 11ft 6in and sleeps sleeps up to 2 adults and 3 children. This Pod is an empty space but has 2 spotlights, as well as a heater and a spare socket. There is a picnic bench outside each pod, and the price includes use of our kitchen facility in the amenity building. But you are advised to bring all your camping kit - apart from the tent. There is a two night minimum stay during the school holidays and summer weekends. .The Family Pod is 8ft 8in by 11ft 6in and sleeps sleeps up to 2 adults and 3 children. This Pod is an empty space but has 2 spotlights, as well as a heater and a spare socket. There is a picnic bench outside each pod, and the price includes use of our kitchen facility in the amenity building. But you are advised to bring all your camping kit - apart from the tent. There is a two night minimum stay during the school holidays and summer weekends. 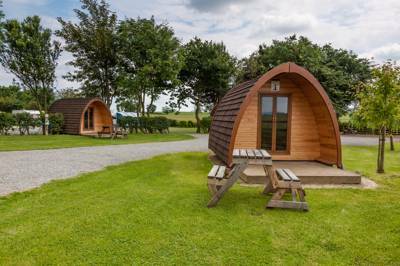 The Small Camping Pod sleeps 2 adults and 1 child (or two small children). It is an empty, carpted space with a heater, light and electric. There is a decking area on which you can cook, but we also have a campers' kitchen facility in the amenity building where there are hotplates, microwaves, kettles, toasters and a fridge. Oh to be out on the hills, leaning against the full force of the North Yorkshire wind and squinting through the rain for a herd of lost sheep. This hardy image of the sheep farmer isn't exactly what springs to mind when we first imagine our holiday – more the rolling, sun soaked dales riddled with inviting looking footpaths – but it’s exactly this lifestyle in the great outdoors that inspires many campsites to be born in the north of the country. Once a working farm, Hillcrest Park, is just such a spot, now fully committed to it’s new life as a campsite. 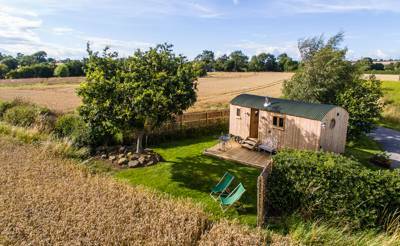 Old outbuildings have been tastefully converted into holiday cottages and a large area of land has been set aside for campervans, all with electric hook-ups. The scene is one that still echoes its agricultural past – views across acres of farmland, mowed and turned for hay in early summer, and buildings converted out of old storage spaces. But at its heart, Hillcrest Park is now a warm and welcoming campsite, a seemingly natural step in the place’s evolution. 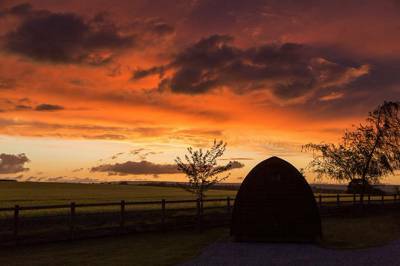 Perhaps most notably, or so we think, are the 10 timber glamping pods, which create the perfect getaway for those who want to experience the outdoors without having to worry about the weather. Well spaced-out and each fronted by a large wood-chipping area ideal for barbecues and meals in the sun, the pods are intended as a handy year-round replacement for the standard camper’s tent. Inside they are well insulated and come with an electric heater, double glazing and sockets. Otherwise it’s up to you to bring your sleeping bag and blankets along (inflatable mattresses can also be hired onsite). The local area follows the trend of history combined with new, modern hospitality. Around seven miles away the picturesque market town of Barnard Castle – named after the castle it grew around – is home to the famous Bowes Museum, a grand gallery set inside a 19th-century French-style chateau. The museum houses the best collection of European fine and decorative art in North England, though it’s unclear what you’re meant to admire most, the artwork or the setting. 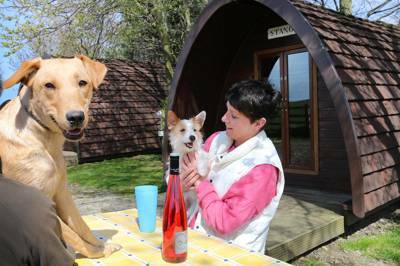 Elsewhere, the dog-friendly campsite is matched by miles of footpaths and endless space to explore, with nearby Hamsterley Forest riddled with family biking trails, just a short drive away. Or, of course, you could start from the site itself, taking in a section of the Teesdale Way that leads you to Fernaville’s Rest, a pet-friendly, Grade II listed pub around four miles away. Before you get there be sure to stop on Whorlton Suspension Bridge for a quick game of pooh sticks. It's the earliest such road bridge in the country and an ideal spot for enjoying the last of the river before you cocoon yourself away in the pub! 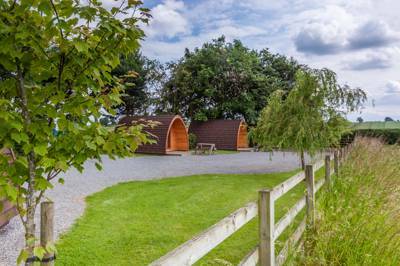 Hillcrest Park is our rural, 6 acre, holiday park in Teesdale. 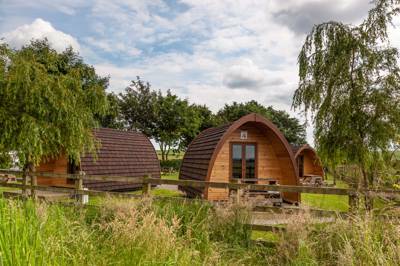 Surrounded by farmland, it offers peace, tranquillity and beautiful views – yet is only 10mins from the A66. It is ideal for walkers, cyclists and dog owners and is close to Richmond, Barnard Castle, High Force Waterfall, Raby Castle and a host of other Dales attractions. 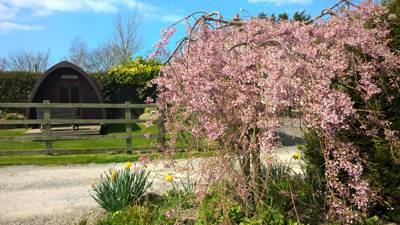 We have a 2 acre field on site, ideal for exercising children and dogs! There is a two night minimum stay during the school holidays and summer weekends. For latest availability and best prices for Hillcrest Park, please use the Date Search above. 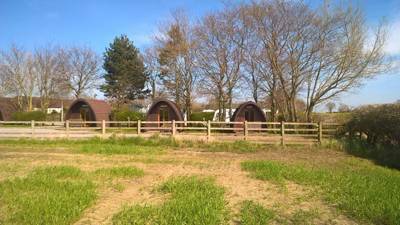 Just had a lovely weekend here, facility's were great, hot showers, nice and clean, lovely little kitchen were you can make toast, tea's coffees, there is microwaves and hobs to use and also a washer and dryer at the cost of £2 per load, there is also a fridge freezer for all to use. there is a nice little communal book stand were you can take a book to read and fetch it back after use, also DVD's games and magazines. The pod itself is so cute, it has a lamp and a small radiator to keep you warm, the only issue I had was there was a quite a few cobwebs above the smoke alarm other wise I would have rated it 5 star, the sight itself holds a little shop in the office were you can also purchase a few things from, overall a wonderful stay, I will recommend this place 100% and hopefully return in the summer months. We braved the wet, windy weather and we’re so glad that we did! Spent the whole evening with the doors open overlooking the beautiful views on this peaceful site. The toilets, showers and kitchen areas were clean and well equipped. We will definitely be returning! Thank you so much! Me and my partner had a lovely time at this site. 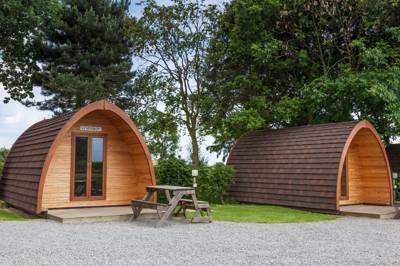 The pod and the site was very clean and the facilities were also. There was the added bonus of the Dottie van to get breakfast from the next morning which was lovely and very good value for money. We will definitely go back and have already recommended this site to friends and family. Lovely picturesque setting recommend to anyone. 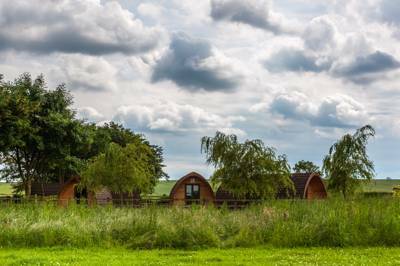 10 timber glamping pods, 20 hard standing pitches with 10 amp electric hook ups and 5 holiday cottages that were once single storey farm outbuildings. Campers, glampers, motorhomes, children and dogs – yes. Party groups or groups of under 25’s – no. A centrally-located amenities building contains free showers, hairdryer, hot water for dishwashing plus a coin-operated laundry. A communal kitchen facility is stocked with hotplates, microwaves, toasters, kettles and a fridge. There is a 2 acre dog exercise field adjacent to the site. 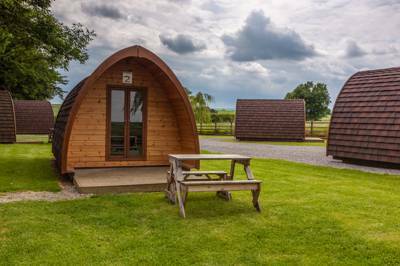 The pods have a lockable window and French doors – all double glazed and the pods are insulated with Cumbrian sheep's wool. There is also a lamp and two electric sockets, while outside there are picnic tables/benches provided for each pod as well as hardstanding for BBQ's. There is a cycle storage area on site and they also hire out camping stoves and mattresses if you require. To the north, it's just 10 minutes or so to Raby Castle (01833 660202) – one of the finest examples of a medieval fortress in the North of England, also boasting a beautiful walled garden and a 200 acre deer park. A similar distance away is Barnard Castle, a picturesque market town where, among other things, the fantastic Bowes Museum (01833 690606) can be found. In the opposite direction, 17th century Headlam Hall (01325 730691) is a grand country house where you can find a challenging 9 hole golf course and a strikingly modern, spa retreat. It's about 10–15 minutes in the car. For natural wonders try High Force, the largest waterfall in England or visit nearby Hamsterley Forest, known for both its beautiful walks and its mountain bike trails. The Bridgewater Arms (01325 730302) is a half hour walk or five minute drive from the campsite and known in the area for its exceptional sea food, or try The Brownlow Arms (01325 718471), a traditional country pub, a similar distance in the opposite direction. For something different, Stable Hearth (01325 730 400) is a great artisan pizza takeaway and Fernaville's Rest (01833 627341), in Whorlton, is a beautifully decorated, dog-friendly pub with a fantastic beer garden in summer. All year. There is a two night minimum stay during the school holidays and summer weekends. From A1(M), north or south, take the A66 Westbound at Scotch Corner. Travel 2 miles and take right turn onto B6274 signposted ‘Winston’. Go through Caldwell Village. Continue for 1 mile and Hillcrest Park is on the left hand side. If travelling south from Scotland on M6, take A66 East at Penrith, J40. Head towards Scotch Corner and take B6274 signposted ‘Winston’. Go through Caldwell Village. Continue for 1 mile and Hillcrest Park is on the left hand side. If travelling North on the M6, at J38 take the A685 to Brough. From Brough, take A66 Eastbound towards Scotch Corner and take B6274 signposted to Winston and Staindrop. Go through Caldwell Village. Continue for 1 mile and Hillcrest Park is on the left hand side. The nearest train station is Darlington (08457 484950), which is a 20 minute drive away.